I wanted some brushes attached to lids for various oils and chemicals. Like rubber cement and the brush - remember those? Lol Couldn’t find anything. So I made these from recycled gelato jars. Drill the hole a bit small and it keeps the brush in place. Unscrew the lid and use the brush still attached. Just received a set of these spill proof cups from Amazon. They work like hot damn as long as you don't fill them above the line. Both those look good. Tubalcain has a video of one he made out of cans (tuna I think) nice design and easy to make as well. Jim Dedmon makes spill proof cups out of slightly modded children's paint cups, similar to the Melissa and Doug ones that ducdon mentioned above. Jim's a pretty cool guy, he sent me a couple and for a klutz like me they're the bees knees. I use unmodified children's paint cups. I was too lazy to implement Janger's idea! 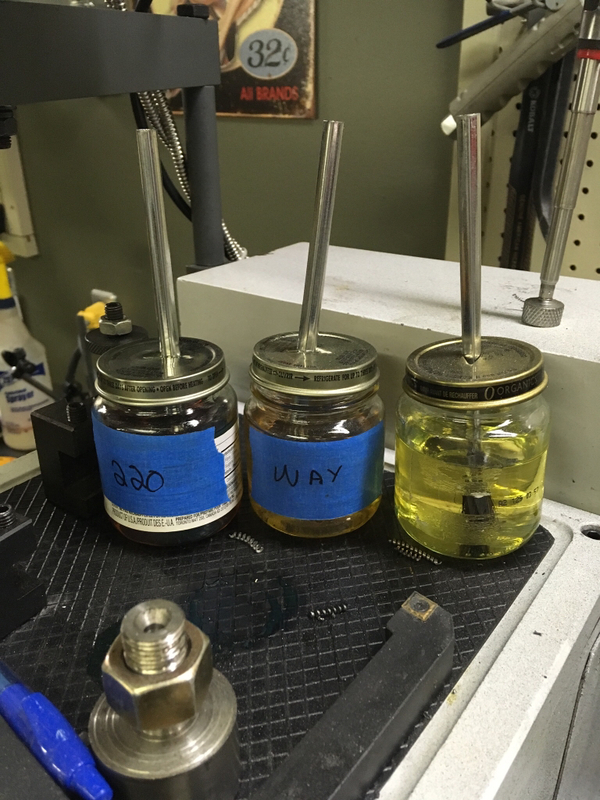 The can on my lathes included cutting oil pump was the only thing that was good about it i had a glass jar prior with a piece of steel in the bottom to keep it in place with a magnet but it was shattered so since the magnet was still good i evolved my setup now it is solid and it will not shatter but it has no lid. Somehow, i will survive i am sure.